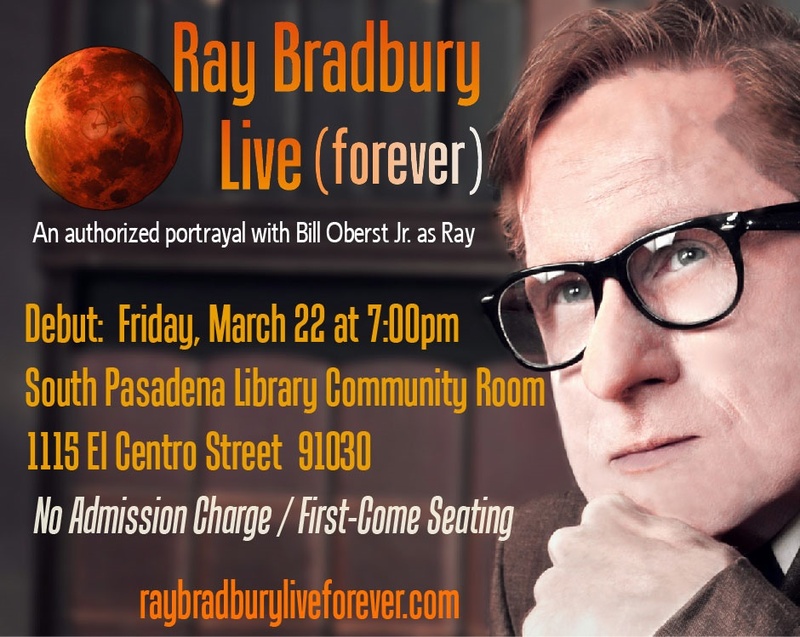 By Steve Fjeldsted: The first public performance of a new touring stage tribute to iconic author Ray Bradbury is scheduled for Friday, March 22 at 7:00 p.m. in the South Pasadena Public Library Community Room. Ray Bradbury Live (forever) is a tour de force officially authorized by the Ray Bradbury estate and features Emmy Award-winning actor Bill Oberst Jr., who’s appeared in 150 movies and TV shows, as Bradbury, with a special appearance by Stacy Rabon as Maggie Bradbury, Ray’s wife and soulmate. Oberst’s script for Ray Bradbury Live (forever) mixes excerpts of Bradbury works like “A Sound Of Thunder” and Something Wicked This Way Comes; selections from 50 years of Bradbury interviews and essays; large-screen video projections, and an original musical score. “It’s not biography” says the actor, “it’s a trip inside Ray’s mind; his loves; in his own words.” In addition to the Bradbury estate, Oberst’s script was vetted by Dr. Jonathan Eller, the Director of The Center For Ray Bradbury Studies and the author of two acclaimed Bradbury biographies, and by Bradbury media scholar Dr. Phil Nichols of the University Of Wolverhampton. 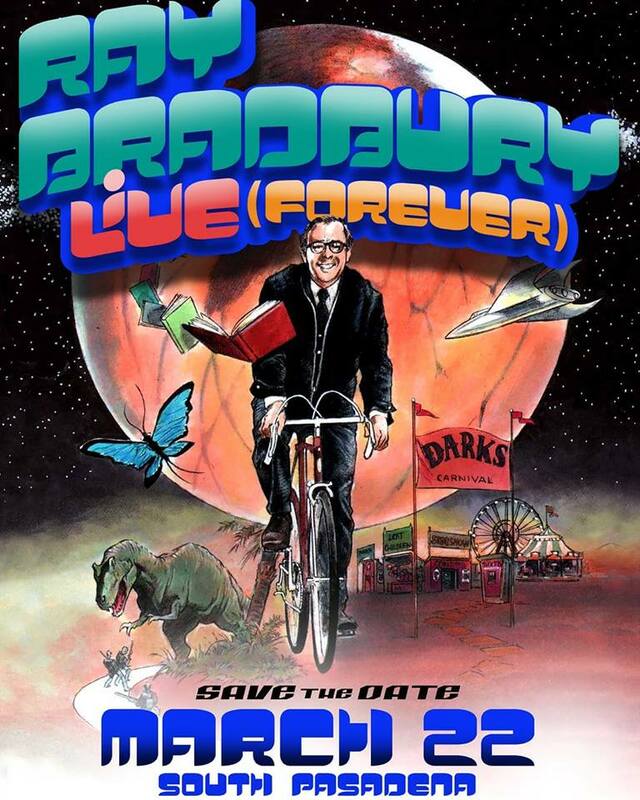 Ray Bradbury Live (forever) is performed by permission of Ray Bradbury Literary WorksandDon Congdon Associates, Inc. The actor adds that it was after his performance of “Pillar Of Fire” before a standing ovation audience at the South Pasadena Library in 2016, he first spoke of his secret dream to do a show as Bradbury. A friend and associate of Ray Bradbury (1920-2012) who was in attendance offered to put him in contact with the Bradbury family. Ray Bradbury was near and dear to South Pasadena and often remarked that the small town atmosphere reminded him of where he was born in Waukegan, Illinois. He also stated that the South Pasadena Library reminded him of the Waukegan Carnegie Library where he first started his lifelong self-education journey which eventually led him to become one of the most beloved and popular American authors. The Community Room is located at 1115 El Centro Street in South Pasadena. Doors will open at 6:30 p.m. and no tickets or reservations are necessary. Admission is free and refreshments will be served. The show is appropriate for all ages. For more information please refer to www.southpasadenaca.gov/library orhttps://raybradburyliveforever.com or call the Library at 626 403-7350. The event is sponsored by the South Pasadena Public Library, the Friends of the South Pasadena Public Library, the Bissell House Bed & Breakfast, and the Living History Centre Fund. Special thanks to 210eastsound, Orville Houg, Alan Jutzi, Robert Kerr, Sally Kilby, Joaquin Montalvan, Jimmy O’ Balles, John Tarpinian, Ray Tatar, David Uwins, and the Lucille and Edward R. Roybal Foundation. Free parking is available after noon in the Mission Meridian Parking Garage located at 805 Meridian Avenueadjacent to the Metro Gold Line Station, only one block from the Library. Upon request made no later than four (4) business days before the event, the City will provide a reasonable accommodation for a qualified person with a disability to have equal access to the event. Please contact ADA Coordinator and Human Resources Manager, Mariam Lee Ko, at (626) 403-7312 or fill out the City’s request form available at www.southpasadenaca.gov and email the form to Human Resources at HR@southpasadenaca.gov. This entry was posted in Like Show Business and tagged Bill Oberst, Ray Bradbury, Steve Fjeldsted by Mike Glyer. Bookmark the permalink. when will the play come to Seattle? Thank you File770.com, for being so supportive of this little effort to honor Ray Bradbury. If anyone is interested in the play coming to their area, please drop me a line. I’ll tour it as much as I can in between shoots. I’m billoberstjr at gmail.